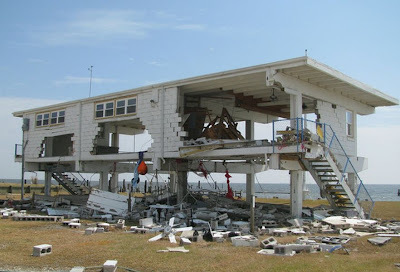 In 2008, Hurricane Ike smashed into the Texas coast causing almost $30 billion in damages. Our friends at Seabrook took a direct hit and, as you can see, their facilities were destroyed. Last w/e they hosted the next Laser circuit event and it was great to see their new clubhouse. The work (and view) is fabulous! The sailing was interesting for me because it was similar to the light conditions expected at the next Laser Worlds in Oman - light and lumpy. Add the waves from the nearby motorboat racing and it was a great opportunity to do some speed testing, especially with fast people like Colin and Mark. I had a slight speed advantage upwind by footing with a tight vang and easing the main (more than others) yet pinching slightly without stalling the centerboard. The key was steering the boat through the waves by moving my weight more than my tiller. Downwind, Colin and Mark had the advantage by working the main and waves better than me, so it made for some close and interesting racing. I led at every mark on Saturday but was reminded not once but twice that it's important to know the course, especially when sailing with other fleets! Sunday had less waves and the speed was much more even with James and Dave moving up in the fleet. Colin won with impressive finishes in all of the races. Thanks for all the great advice at Seabrook this past weekend. This was my second two day regatta on a Laser and finished tied for 7th. Pretty good considering last year I couldn't even keep my boat upright! I learned a lot trying to chase you and Colin to the top mark; not enough can be said for seat (boat) time. Steering with the hull rather than the rudder is something I think you should write about in detail. You do it so well and it is definately faster by a mile (no pun intended). Looks like it'll be September before we see you all again. Again, thanks for your help. I was interested in that comment about "pinching slightly without stalling the centerboard." What does it feel like when you "stall the centerboard"? I understand the concept theoretically but don't know how I would tell if it's happening when I'm sailing. The CB does three things - stall, work normally, and lift. Stalling comes from pinching too high and losing speed, and then the boat feels dead. Feeling the CB is something I learned about 20 years ago when I had the pleasure of living on the water and was able to sail at night. There are many things that can be learned when you starve yourself of the normal things that we use during the day and they all have to do with feeling the boat's movement. These will be a series of posts and will cover footing to point higher, a faster way to go through certain waves, what I call "pressing," and how to get more lift out of the CB. Note that this was all done on a lake, so these are definitely flat-water techniques. 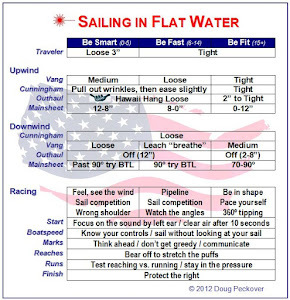 I have tried to simulate this by sailing during the day with my eyes closed, but it's just not the same. The trick is to really starve your regular senses and then get a feeling for what the other senses tell you. 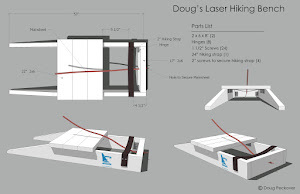 It took me several months to really get this and I will do my best to describe them when I write these posts (first, Pam has some news on the Laser issues and I need to finish other commitments, and also finish documenting the cheat sheet stuff). 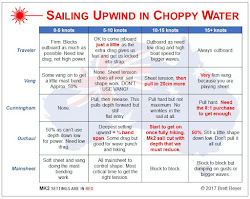 In the meantime, here's a quick summary for getting CB lift in 5-10 in flat water: set up for footing (tighter vang, main a little loose) and then heel the boat to windward for a moment. If the CB digs in, you're feeling the lift but this will only last for a few seconds, so you have to go vertical and perhaps bear off a bit to regain speed. Keep repeating this to get the "digging in" feeling. That's the lift. My theory was that it's because the water is flowing up the CB with the hull as a winglet, and not down the CB with no winglet. When I was with Frank Bethwaite last March, we talked about this and he agreed that this hull-as-a-winglet was probably the reason for the lifting feeling. But enough on the theory - in the right conditions and with enough practice, it's easy to find when the CB is stalling, normal, or lifting, and when the lifting works, it's really fast!